"William Shakespeare takes credit for being the only playwright to have no less than five of his plays simultaneously appearing on Broadway." The Bard of Avon. England's national poet. Greatest writer in the history of his language. Well, that last one is subjective. William Shakespeare (baptized 26 April 1564 - died 23 April 1616), the only playwright most people can name, has been a major influence on English language fiction for 400 years. While most only know his plays through Popcultural Osmosis, the tropes he invented or popularised (to say nothing of a significant portion of the English language) are still with us today. Many of his plays and plots are traceable back to older sources, but he made them his own. Trace back most of The Oldest Ones in the Book and you will find Shakespeare, and before him no one anyone much has heard of. Shakespeare's late tragedies, Hamlet, and King Lear, are widely considered to be among the greatest plays ever written, while such other works as Macbeth, Romeo and Juliet, and Othello have profoundly influenced Anglophone culture. Shakespeare holds the record of having four of his plays running on Broadway simultaneously. Due to Shakespeare's wide-ranging influence and extremely high renown, any time you want to establish a character as smart and classy, just have him quote a couple of apropos lines from a Shakespeare play. It works every time, hero or villain. This is quite the irony considering his plays were not exactly high-brow entertainment in their day. Every generation seems to see Shakespeare as one of theirs, and attribute to him whatever attitudes or beliefs are considered "proper", "cool", or "intelligent" at the time. The Georgians saw him as a natural man whose brilliance was completely innate, while the Victorians and Edwardians saw him as a proper Whig gentleman with proper Whig opinions on women, foreigners, war, etc. Most notably, in the past thirty years he's been turned into a rebel who was 'forced' to work for those nasty royals and aristocrats because he had no other choice. Even on this very wiki, Shakespeare is said to have "had" to write his plays in a certain way for James or Elizabeth or Essex, with the unspoken assumption that he would have done things very differently had those evil meddling nobs not been controlling and censoring him. This, to say the least, is highly unlikely. Shakespeare is known to have jumped at the chance to work for nobility and royalty, and he also likely sincerely agreed with them in almost everything they said or did. Worse are the people who think he was a secret republican because he might have been a Catholic, and in modern times Catholics are sometimes republicans. This astonishing leap of logic ignores the fact that Catholics in Shakespeare's day wanted a strict monarchy as much as the Protestants did, only one headed by a Catholic king; the few republicans actually around were staunchly Protestant. He's also become a popular fictional character in his own right. Perhaps you want to emulate this esteemed fellow? Epileptic Trees are hardly new or limited to genre fandoms. 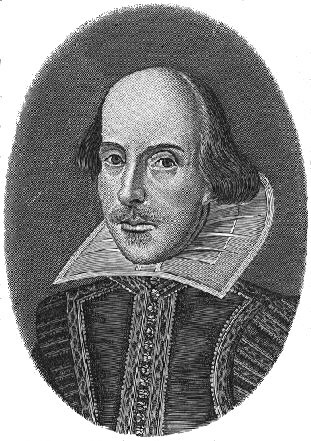 Since the early 18th century, some have speculated that "William Shakespeare" was just a pen name for one or more other individuals. People who believe this hypothesis are generally called anti-stratfordians; those who hold to the view of Shakespearian authorship that William Shakespeare did in fact write the works attributed to him are dubbed stratfordians. With entire books and websites dedicated to arguing one way or the other, this is clearly Serious Business to some. Aerith and Bob: It was a common convention in Elizabethan/Jacobean theater to give comical characters, especially working-class ones, common English names regardless of where the play was set. Shakespeare often does this, but he also peppers his plays with non-comical characters whose names are incongruous with the plays' settings. Hamlet has Laertes and Ophelia (Greek), Fortinbras (phonetic French), and Marcellus, Polonius, and Claudius (Roman); Romeo and Juliet has Tybalt (a variant of the English Theobald); and The Merchant of Venice has Shylock (English). Ambiguously Gay: A fair few characters. Anachronism Stew: Shakespeare rarely did the research, though sometimes he did do the research and modern critics assume he did not (such as the canal system in Italy, linking many "landlocked" Italian cities by boat to each other and to the Mediterranean Sea). But no one watches his plays for the historical content, even the ones that are supposedly about historical events. Most of his contemporary audience knew very little about Italy or any other country outside of England, and wanted a good story without caring about the geography. Antagonist in Mourning: Marc Antony for Brutus in Julius Caesar, Octavius in turn for Marc Antony in Antony and Cleopatra, and Fortinbras for Hamlet in Hamlet. Antiquated Linguistics: While his wording was modern at the time, modern use of it falls under such. Anyone Can Die: In his tragedies, and how. Beam Me Up, Scotty: One the one hand, some of the more famous lines he put in the mouths of famous men have actually been attributed to them in later years. On the other, some of the Popcultural Osmosis quotations of his work mangle them somewhat. For example, "Double, double, toil and trouble" is sometimes quoted as "Hubble, bubble..." or similar. Beta Couple: including, appropriately, Benedick and Beatrice, although in popularity they've far eclipsed Much Ado About Nothing's Official Couple, Hero and Whatshisface. Crystal Dragon Jesus: In non-Christian settings, the names may be pagan, but the doctrines and practices are Christian. Crosscast Role: Any woman in a Shakespeare play as it was originally conceived. Double Entendre: Lots and lots and lots. Your high school teachers did not mention half of them, probably on purpose. Get Thee to a Nunnery: Hamlet is the Trope Namer. (Many of his plays are absolutely bawdy, but language has changed so much that modern audiences will not understand this; can seriously impact the comedies, in particular, which lose a lot of their humour) There is at least one version of the script meant for reading that directly points out the particularly obscure double meanings to aid modern readers, along with showing stage actions. Getting Crap Past the Radar: Shakespeare's plays are full of adult humor. Most of its contemporary significance has since been forgotten in everyday life. Grokking the Horrorshow: Often credited with inventing a large number of words and using existing words in new ways. It is more accurate to say that his works are the earliest written use of these words. He might not have actually coined them. Ho Yay: Enough to have his own page. Kill'Em All: Mostly in the tragedies, though the histories can be fairly bloody as well. Local Reference: Quite a few of his plays have references to England even when there's no apparent reason to. Mainstream Obscurity: With the exception of one or two from high school, most people don't actually watch or read Shakespeare's plays, though everyone knows him. Missing Episode: Records indicate that Shakespeare wrote plays entitled The History of Cardenio and Love Labour's Won. Unfortunately, no copies of them are known to exist. A playwright named Theobald claimed in the 1700s that his play Double Falshood was based on original manuscripts he had of Shakespeare's Cardenio (with his own myriad changes and updates for an 18th century audience), but as he never actually produced this manuscript, this is considered a hoax. Oracular Urchin / Waif Prophet: Child, jester, and/or crazy person? Count on them to speak God's own truth. The Smurfette Principle: But when women aren't allowed to perform on-stage, what're ya' gonna do? Story Arc: Some of his histories have many recurring characters. Sweet on Polly Oliver: Common in cross-dressing scenarios. Sweet Polly Oliver: Shakespeare really liked this trope and used it in a number of his comedies. In his day, the practice of men dressing as women for female parts added an additional meta-level to the comedy. Weddings for Everyone: Most of the comedies end with a wedding. Titus Andronicus, however, begins with two consecutive and high-profile weddings, then quickly goes downhill. Wild Mass Guessing: According to Bill Bryson, any claim about Shakespeare's personal life beyond what's on official records is this given how staggeringly little is actually known about Shakespeare's home life. What Do You Mean It's Not for Kids? : Junior High teachers do not seem to understand that either: their students are not going to understand a word, or they shouldn't. You Fail Geography Forever: Considering that John Dee was considered an expert of geography because he had travelled Europe, and his audience didn't really care about accuracy on this topic anyway this is hardly a surprise. You Fail History Forever: Mostly due to him not doing the research, but sometimes due to his wish to please whomever was on the throne. For example, even if Shakespeare had had access to a more accurate and sympathetic source on Richard III, he probably wouldn't have used it anyway since Richard was overthrown by Henry Tudor aka Queen Elizabeth's grandfather and King James I/VI's great-great-grandfather. This page was last edited on 2 February 2019, at 15:53.